Product prices and availability are accurate as of 2019-04-21 18:27:01 EDT and are subject to change. Any price and availability information displayed on http://www.amazon.com/ at the time of purchase will apply to the purchase of this product. 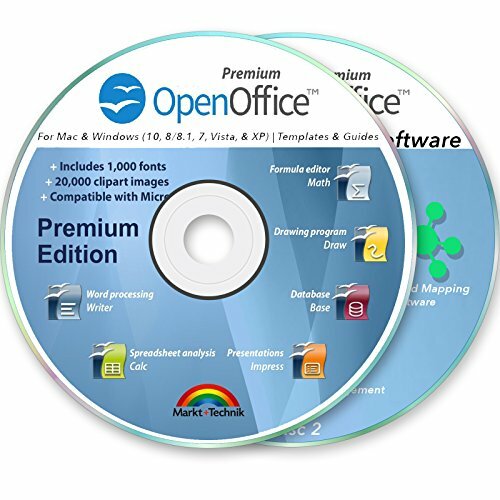 The Open Office 2018 Premium 2 Disc Set gives you the capabilities of Microsoft Office + more for a fraction of the cost! This "4 for 1" bundle is the #1 best alternative to those expensive office suites. Runs on Microsoft Windows 10, 8.1, 8, 7, Vista and XP (32-bit and 64-bit). Mac OS 10.6 and above. Requires Java. Disc 2: Boost your Performance. 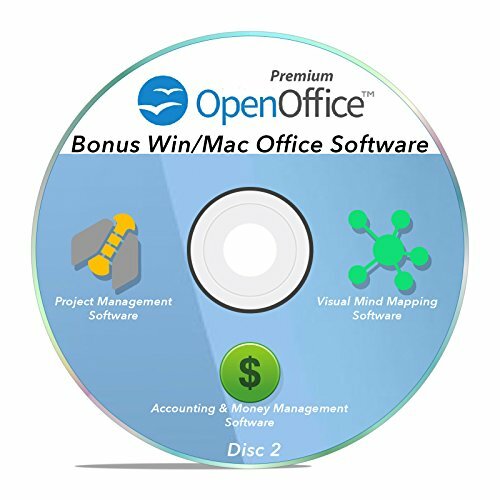 Bonus Office Software Disk includes 3 software applications All compatible with Windows PCs and Mac computers. 1.) Project Management Software: Get more done with this easy & fun task management productivity software. 2.) 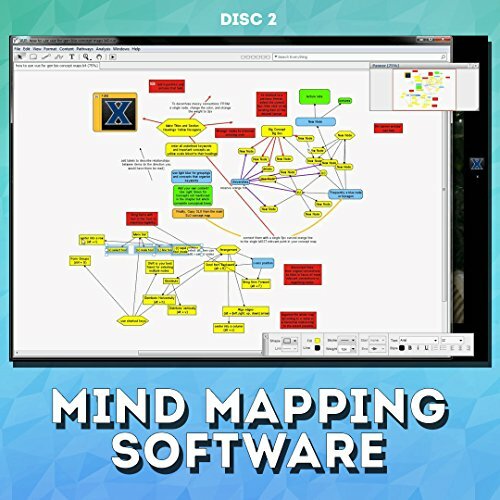 Mind Mapping Software: Visualize your thoughts and ideas! 3.) 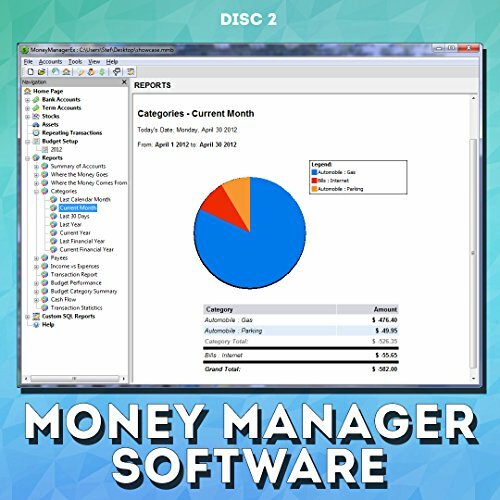 Money Management Software:Get a clear understanding of where our money goes and help you track expenses in your personal life or business. 4.) Keyboard Shortcuts Guide: You'll also get keyboard shortcut guides for Windows 7, 8, 10 and Mac. Learn all shortcuts on your computer that will make working even faster. COMPATIBLE with most Microsoft Office Apps / files. Excel, PowerPoint & Word. The #1 MS alternative just got bigger with the Premium 2 DVD set! 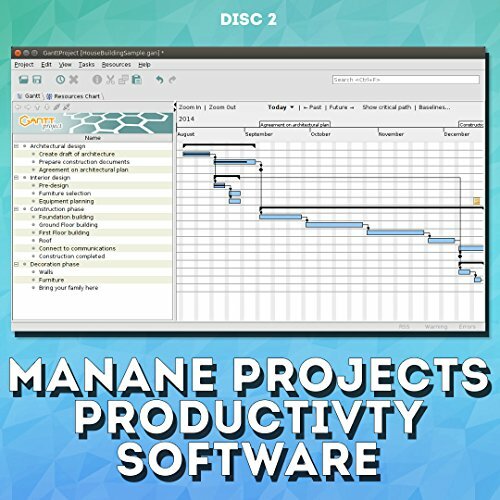 Disc 2 Includes 3 software applications that will boost your speed, productivity, organization, and maybe even your wallet. (see description for details) Premium Bonuses: Huge Templates Library (Resumes, forms & more), 20,000+ ClipArt images, premium fonts pack, premium technical support. Easy to install & use. The Office Suite 2018 program is perfect for word processing, spreadsheet analysis and presentations (just like Office 2016 Professional) Works for Windows 10, 8 / 8.1, 7, Vista, & XP as well as Mac OSX (10.6 & above). This premium edition is the only one with support for Mac computers.